Control over Georgia was a long fought battle. The Yamasee Indians lived in Georgia, along with the Cherokee and Creek Indians long before European exploration. As the English and Spanish traders ventured into nearby regions and established colonies and settlements, control became a point of tension between the two groups. Eventually, the Spanish and Yamasee Indians left the area and the British moved in; MP James Oglethorpe petitioned to make Georgia a colony for England’s poor, and secured a royal charter for the colony in 1732. Initially, the trustees of the colony forbade slavery in Georgia; this had not been done in any of the other colonies. However, in 1749 the ban was repealed as it became clear that a plantation economy was the most profitable for Georgia’s agricultural conditions. Profits from rice, indigo, and sugar cane plantations came to dominate Georgia’s economy. Although Georgia supported the other 12 colonies in the American Revolution, their only demand was “No taxation without representation.” On the whole, the colony remained fairly uninvolved in the conflict and signed the US Constitution in 1788. After the revolution, Georgia’s agriculture boomed, thanks to Eli Whitney, the creator of cotton gin (a machine which capable of separating cotton fibres from the seed on an industrial scale). This sudden growth of the cotton industry caused a huge influx in the Georgia population and continued importation of slaves from neighbouring states like South Carolina. During the Civil War, Georgia seceded from the Union to join the Confederacy, defending slavery in an attempt to preserve their economic prosperity. Georgia, however, was devastated during the war and especially during General Sherman’s infamous March to the Sea, where he burned Atlanta to the ground and left a trail of destruction across the state. Although slavery ended with the Civil War, equal rights were far off in Georgia. The Jim Crow laws enacted in the late 19th century, which mandated racial segregation in all public buildings and facilities, contributed to the disfranchisement of former slaves. It wasn’t until the Civil Rights Movement began in the 1940s that African Americans began to see equality. Georgia is also home to famed Civil Rights leader Martin Luther King Jr., who was born in Atlanta in 1929. 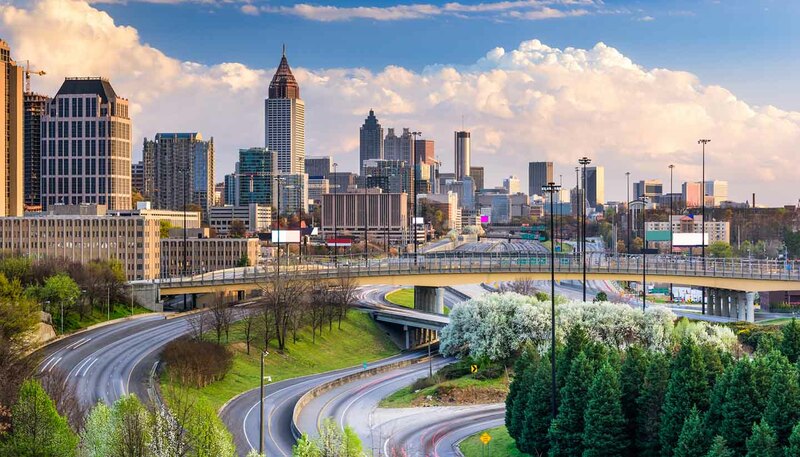 Today, Atlanta is a hub of the south and a leader in industry, manufacturing, and retail and notably, is the home of Coca-Cola. A hub for shopping and tourism, Georgia is a popular destination for holidays and visitors. Christianity is the most prevalent religion in Georgia, with Baptist and Methodist being the largest groups, followed by Catholic and other Christian faiths. There is a small population of Jewish and Muslim residents as well.